What Is ‘Moon Gardening’ Anyway? Despite its name, ‘Moon gardening’ doesn’t involve sowing seeds by the light of the Moon. Explaining what Moon gardening really is, this practical introduction shows how it can benefit your horticultural activity. Despite its name, ‘Moon gardening’ doesn’t involve sowing seeds by the light of the Moon. It’s far more practical than that! As every gardener knows, there’s no magic spell for a thriving garden. But there are ways to work in harmony with the earth and environment to help your garden reach its full potential. The Moon influences the Earth every day – it’s common knowledge that the Moon’s power shapes our water to create tides – so shouldn’t the Moon also affect other parts of the Earth and the water within it too? Moon gardening – or ‘lunar gardening’ – is simply about adapting your daily gardening tasks in order to benefit from lunar patterns. Much like planting at the right time of year to fit climatic changes, its aim is to work with the Moon and environmental conditions to make the most of their positive influence. Moon gardening works on the principle that the Moon moves through different phases, passing through the twelve zodiac constellations. As it does so, it influences different plants in different ways. There are four categories of plants – root, leaf, fruit and flower – which are designated according to the part of the plant that we usually eat or work with. They may sound familiar to anyone who has come across the biodynamic gardening movement founded by Maria Thun. The relative position of the Moon to the Sun, the Earth, and through the seasons, has an impact on plant types in different ways. For example, in the lunar ‘spring’, the Moon rises for 13 and a half days, following the path taken by the Sun from December 21st to June 21st. During this time, sap usually rises in all plant life and increases their vivacity, so it’s a great time to make cuttings or grafts, harvest leafy plants and cut flowers for bouquets. With specific guidelines on when to sow, plant and harvest throughout the year, the Moon gardening technique brings a new level of precision to gardening and helps you to get more out of your allotment or vegetable patch. By working at favourable times with your chosen crops, you can produce better tasting and more plentiful vegetables, as well as stronger, healthier plants and flowers. Although it’s now slipped out of mainstream gardening, this age-old technique has a dedicated following. Based on over 35 years’ experience from French lunar gardener Céleste, the annual Jardinez Avec La Lune is bought by 100,000 people every year, with over 2 million copies sold in its lifetime. 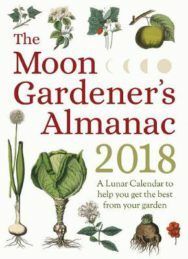 For 2018, Floris Books has made this bestseller available in English for the first time in The Moon Gardener’s Almanac. Why not download our free January sampler and give it a try for yourself? The Moon Gardeners’ Almanac is a practical guide to harnessing the Moon’s positive influence over plants and flowers as part of your everyday gardening work. 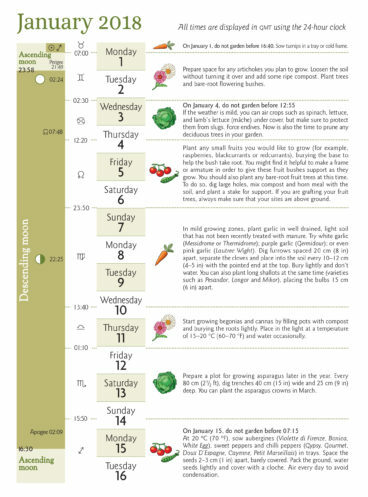 Fully illustrated with easy-to-follow diagrams and space for your own notes, this essential month-by-month guide makes it easy to plan your gardening tasks. It makes a perfect stocking filler for any gardener or allotment keeper this Christmas. The Moon Gardener’s Almanac 2018 by Thérèse Trédoulat and translated by Mado Spiegler, is available now priced £8.99 from Floris Books. 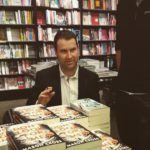 Check out Floris Books on Facebook for details of an exclusive discount code which runs until 14 December.